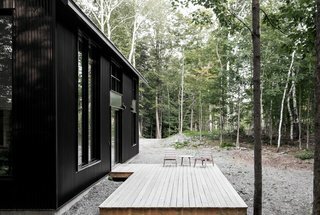 This voluminous cabin in Austin, Quebec, has a sharply pitched roof and a bright and lofty interior that’s a surprising contrast to its austere, angular exterior. 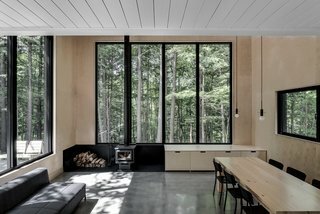 Designed by Montreal-based practice APPAREIL Architecture, Grand Pic Chalet is inspired by the colors and vertical lines found throughout the forest around the property. 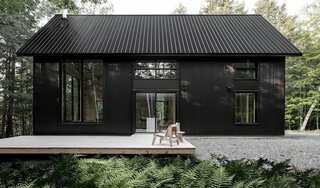 The owners were looking to build a home where they could come together with family and friends to enjoy the salubrious nature outdoors. 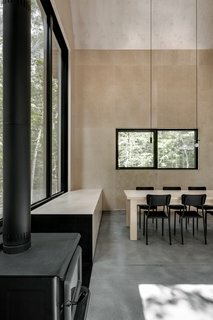 To meet their request, the architects thought about how to best ventilate and brighten the interiors, and connect the chalet with its environs. 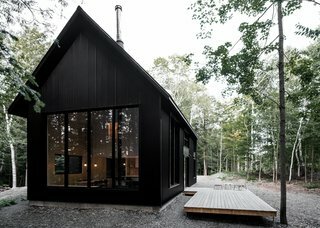 On the periphery of the site, the team created a parking space some distance from the 1,600-square-foot property so that the owners and their guests can walk along a forest pathway before arriving at the chalet, which seems to emerge through the trees. 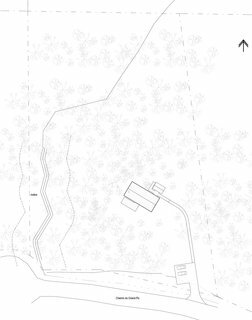 The path from the parking lot then transforms into cedar sidewalks that lead to the chalet’s two pavilions, consisting of the main living quarters and a small storage shed—which follows the form of the larger structure. 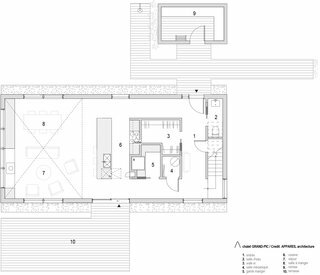 The interior plane of the living quarters is arranged around a technical core, with a kitchen, mechanical room, large pantry, and "garde manger" at the center. 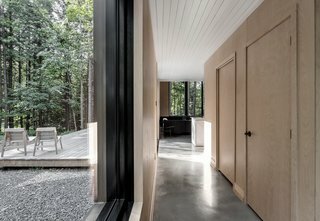 On the ground floor, doors and walls were kept to a minimum in order to leave the space feeling as open and uninterrupted as possible. 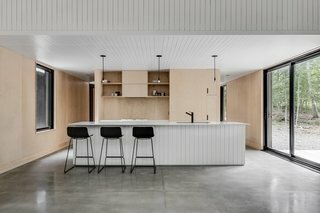 From the kitchen, sliding doors lead out to a sitting area on a small wooden deck. 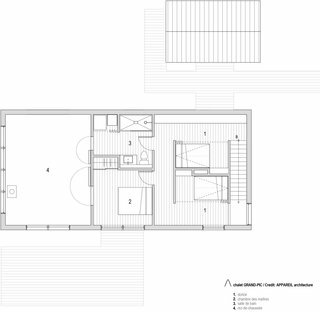 A master bedroom, bathroom, and dormitory room are located above the technical core on the upper level. 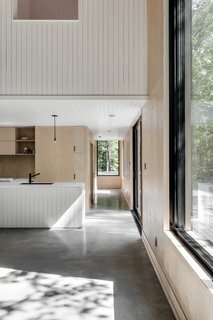 These spaces feature interior openings that overlook the living and dining area on the ground floor. 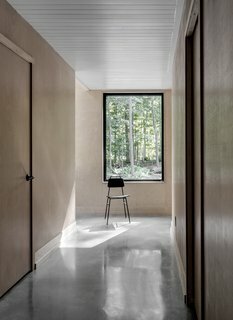 Interior openings on the upper-floor bedroom and bathroom, along with massive, elongated windows, draw in plenty of sunlight. 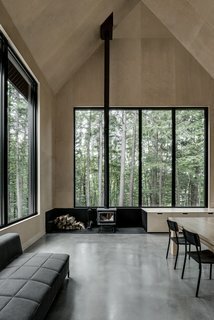 When the windows and doors are open, fresh forest air fills the chalet. 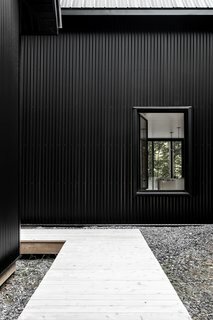 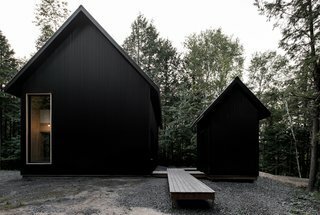 Juxtaposed with the black facade, the indoor spaces were deliberately built with light-colored materials like Russian birchwood and ribbed-wood surfaces painted white. 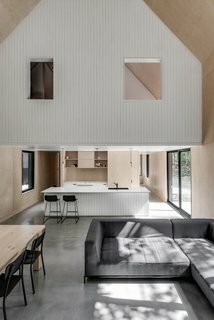 This was done to accentuate the lightness and luminosity of the interiors.